Website and processes: 12 Apr 16 Anon, 4/5 Good "very quick process"
An opportunity to see the Essex countryside as you have never seen it before. 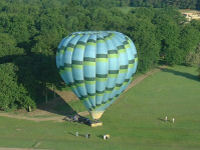 Weekday balloon flight valid Mondays to Fridays excluding bank holidays. We meet at the take-off site, where you are welcomed by the balloon pilot and ground crew. The balloon is prepared and inflated ready for the passengers to climb aboard. You are welcome to participate with the preparation or feel free to watch with your family and friends and take photos. Once in the air, the balloon rises allowing you to gaze down upon villages, towns and the countryside. The balloon basket provides an excellent vantage point for aerial photography. Your pilot is also able to turn the balloon using ''rotation vents'' - thus providing you with a truly panoramic view as you float through the air to ensure you return home with the pictures you want. Hot air balloons float along on the breeze and so you will not feel any wind in the basket. Because you float with the breeze, this also makes every balloon flight a unique journey over the Essex countryside. During the flight in-flight photographs are taken. These are photographs taken from outside the balloon of everyone in the basket (it's clever how we do it!). These can be ordered at the end of the flight. After one hour or so of ballooning over Essex and sometimes Suffolk we land to be met by the ground crew and start our Champagne celebration. In the traditional manner we celebrate the balloon flight with Champagne, or if you prefer orange juice or Buck's Fizz. During this time each passenger is presented with a commemorative hot air balloon flight certificate to mark the occasion. Minimum unaccompanied age 16 years. Although we can accomodate passengers with a variety of disabilities, we cannot accommodate wheelchairs. Passengers should have a reasonable degree of mobility as access into the passenger basket is via steps in the wickerwork. Meeting locations/launchsites may be subject to change for operational reasons, eg) wind direction. We take off from Chelmsford, Billericay and Brentwood area, Braintree, Halstead, Colchester and Kelvedon. After the flight there is the opportunity to order the in-flight photographs taken during the balloon flight. They are a set of 2 mounted photographs, each measuring 25cm x 20cm (10"x8"). One photograph is of everyone in the basket taken during the flight and the other photograph is the balloon taking off. Both are mounted in a quality double sided presentation folder. Total cost including p+p 20 UKP. Billericay, Essex, CM11 2UD . The voucher will have Brentwood (Barleylands Farm Museum) printed on it, but it can be used from..